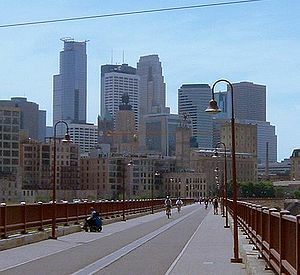 At some point, coming or going, where a trip to Iowa is concerned, Minneapolis looms large and essentially unavoidable. A metropolitan area that all but defines the term “urban sprawl”, we found ourselves once again attempting to circumnavigate it with as much expediency as possible on our return trip to Canada last week. Coming up I-35 and entering the interstate labyrinth from the southern edge, it can easily take well over an hour to break free. Compounding this was Rob’s quest for another two bar stools for our new kitchen breakfast nook. The pricing on everything under the sun hovering just below insanely cheap in the States, we’d found two chairs at the Pier 1 in Dubuque and determined that another two could be secured in another store in Michelle Bachmann territory. Dee is an extraordinarily intrepid traveler for her age. Broken to the backseat during her 5th year and first in Canada by the vast expanse that is Alberta specifically but Canada generally, she can ride six to seven hours with nary an “are we there yet?” But a week of intense spoiling by her grandmother softened her a bit and the endless city of Minneapolis quickly mushroomed into a Groundhog’s Day experience. 30 minutes later her attention wandered back to the seemingly unchanged landscape. And 30 minutes after that? “Yes, we are,” Rob said. “Minne is a native word,” Rob said. “It probably doesn’t mean small,” I added. [chuckle] this child will be a dangerous conversationalist in a few years. trust me, i raised two of them. She already is and we live in fear of it getting worse. Ah, the wisdom of your child. Next time you need to stop by our home! Water (slapping foredhead), of course. And yes, next time we need to stop by.